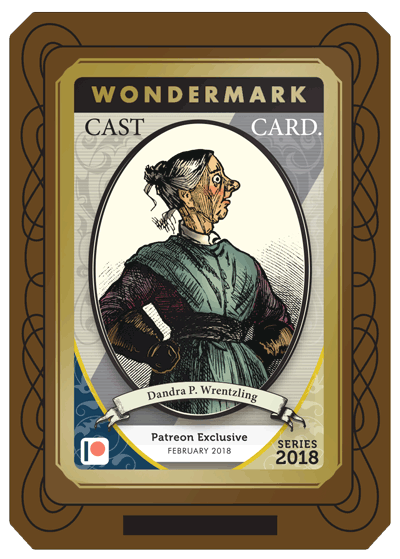 Wondermark Cast Cards are little plaques, featuring portraits of the Wondermark cast of characters, that commemorate various moments we share together as friends. 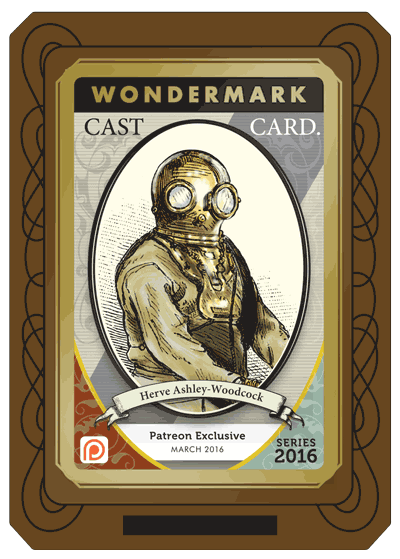 Each card is produced by me here at Wondermark HQ, and issued to honorees for a limited time. Each card also features, of course, a comprehensive list of that character’s vital statistics on the reverse. 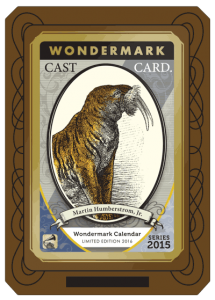 Included with all orders of the 2016 Wondermark Calendar, Un-Named Beasts of the Forgotten Wilds (And the Names I Gave Them). 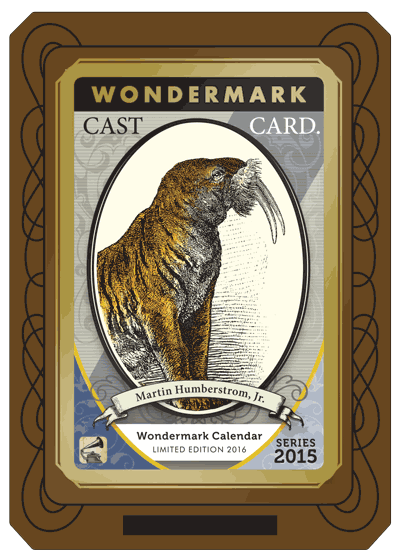 Martin also adorns the cover of the calendar. Calendar Ace! 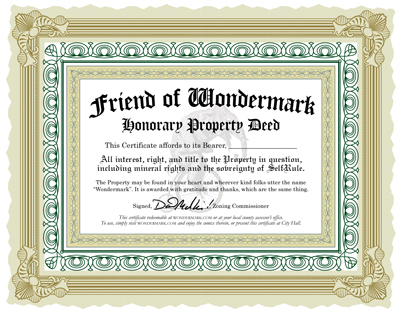 Awarded to those who have collected five or more Wondermark Calendars over the previous nine years. 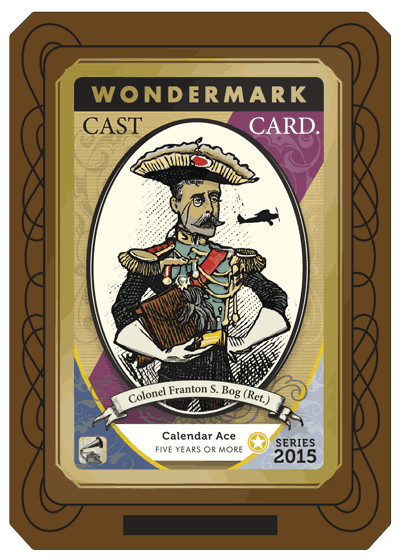 The Col. is a character from the 2010 edition. Patreon Exclusive (January 2016). Sent to participants in the monthly subscription program. 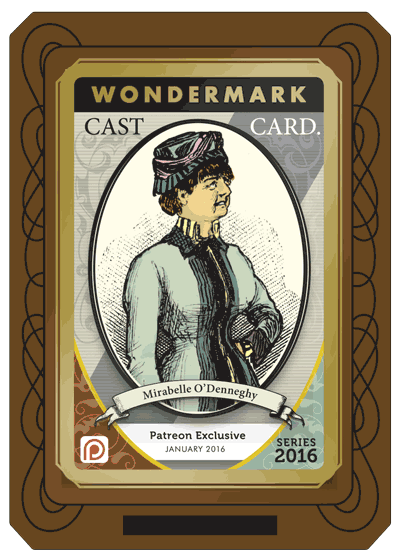 Mirabelle is from Wondermark episode #1056. Patreon Exclusive (February 2016). Premium subscription card. 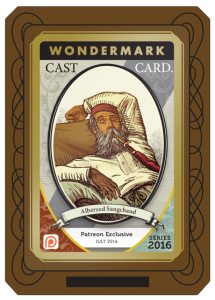 The gentleman pictured is from Wondermark episode #1125. 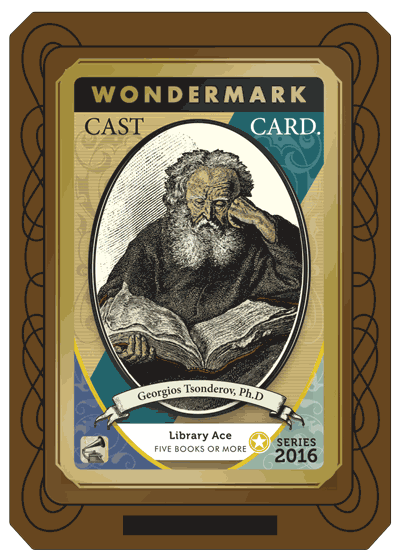 Library Ace! 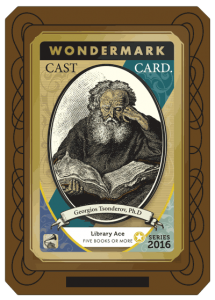 Awarded to those who have collected at least five of our lovely Wondermark books and submitted for the card in 2016. 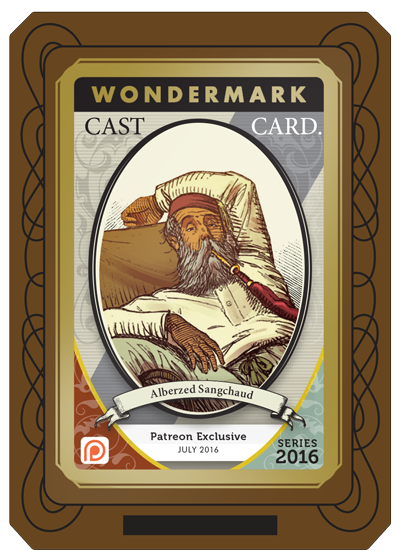 Patreon Exclusive (March 2016). 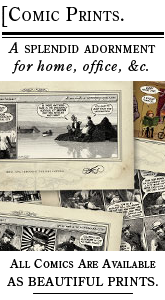 This subscription card features the (doomed?) 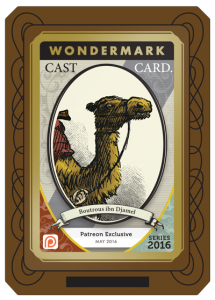 star of the classic Wondermark episode #378. 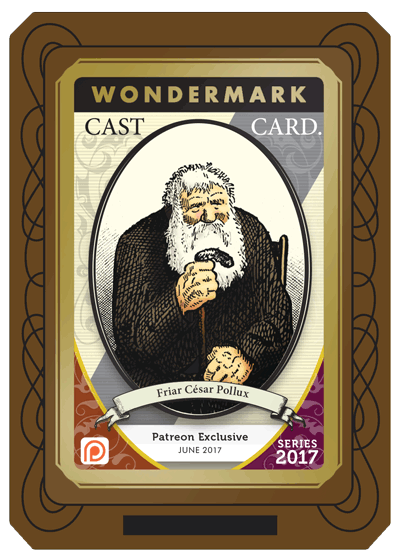 This card was available by meeting me at a convention in 2016 and commissioning a Roll-a-Sketch drawing! This character in particular hails from the Roll-a-Sketch Yearbook, our calendar for 2014. 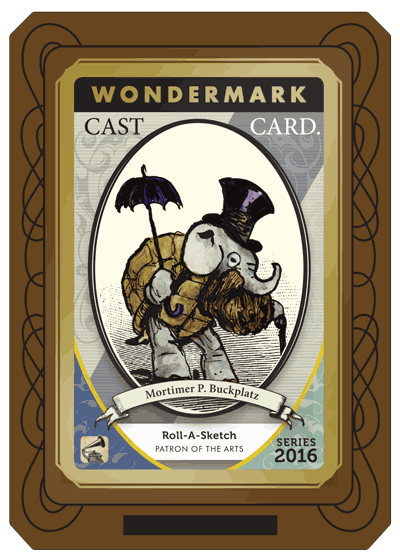 If you commissioned a Roll-a-Sketch in 2016 and didn’t get one of these, you can email me (with a picture of the sketch) and I’m happy to send you one retroactively. Patreon Exclusive (April 2016). Sent to participants in the monthly subscription program. 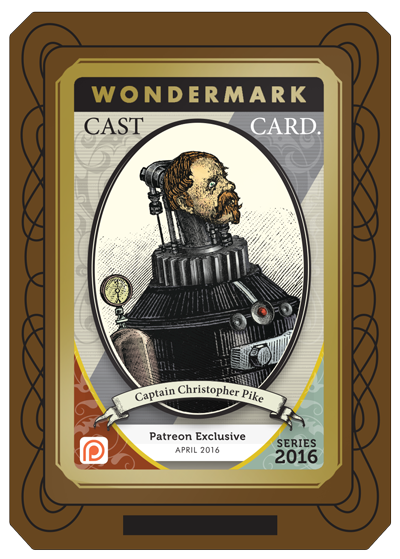 Captain Pike is from Wondermark episode #546. Patreon Exclusive (May 2016). Sent to participants in the monthly subscription program. Boutrous is from Wondermark episode #558. 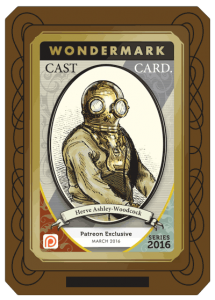 Patreon Exclusive (June 2016). Sent to participants in the monthly subscription program. 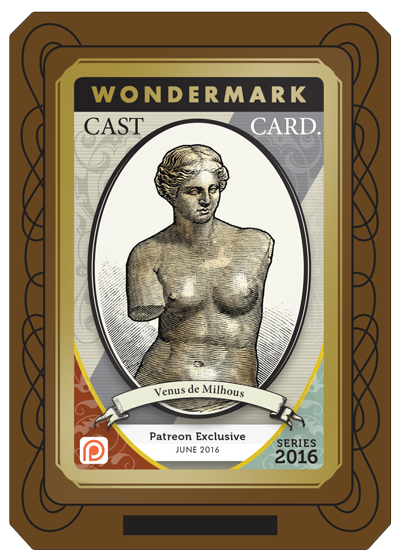 Venus is from Wondermark episode #345. Achievement card! 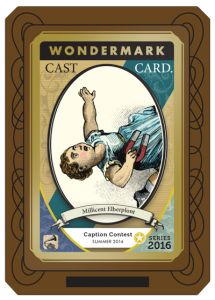 This card was awarded to winners and honorable mentions in the Summer 2016 Wondermark Caption Contest! Winners can be seen here. Patreon Exclusive (July 2016). Sent to participants in the monthly subscription program. 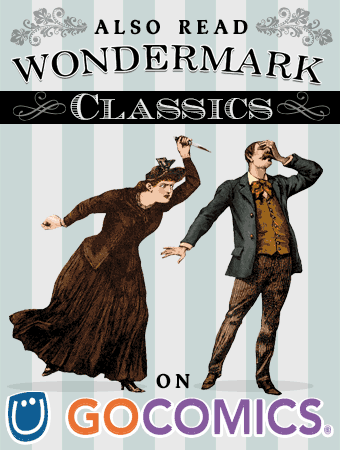 Alberzed is from Wondermark episode #543. 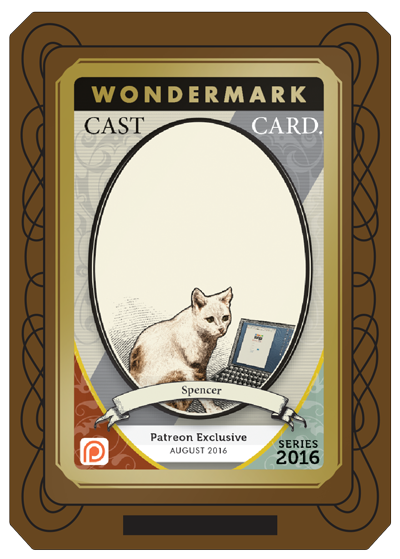 Patreon Exclusive (August 2016). Sent to participants in the monthly subscription program. 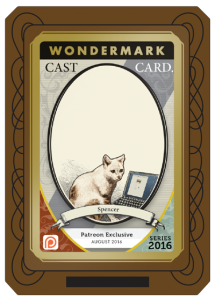 Spencer is from Wondermark episode #119. 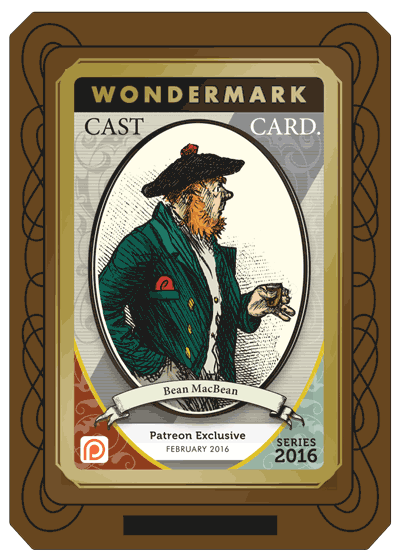 Patreon Exclusive (September 2016). Sent to participants in the monthly subscription program. 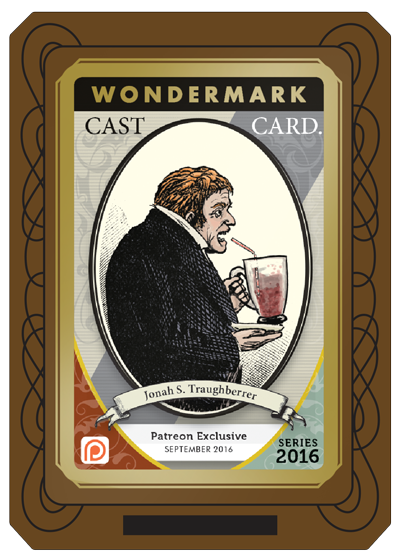 Jonah is from Wondermark episode #1037. 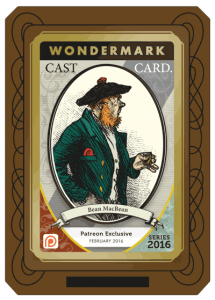 Patreon Exclusive (October 2016). Sent to participants in the monthly subscription program. 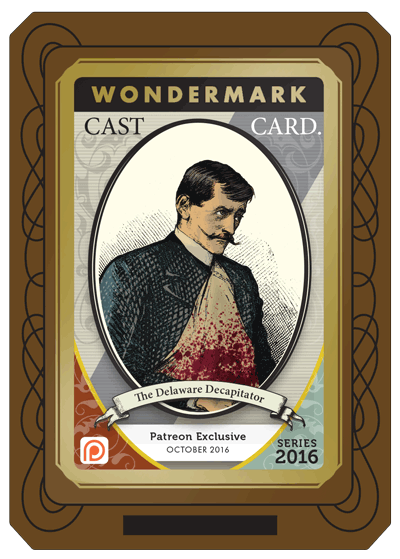 The Decapitator is from Wondermark episode #081. Patreon Exclusive (November 2016). Sent to participants in the monthly subscription program. 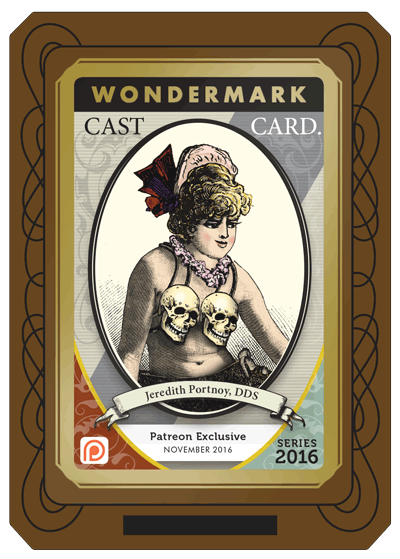 Jeredith is from Wondermark episode #1073. 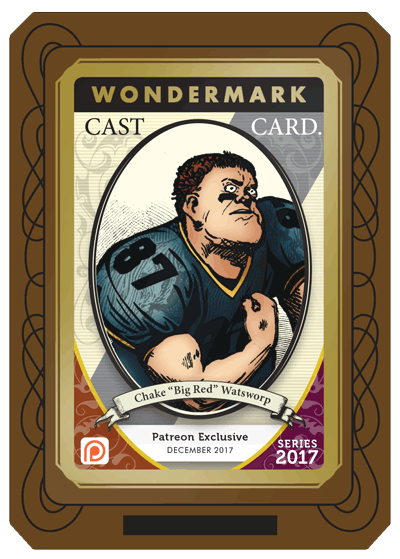 Offered with copies of the 2017 Wondermark Calendar, The Absurd Sports League All-Stars. 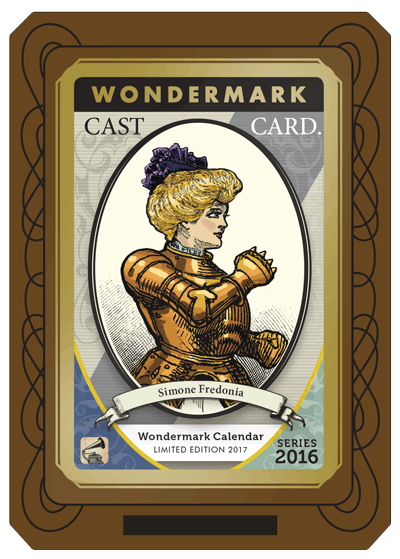 Simone is one of the Pox-Whip (Loud Checkers) athletes profiled in the calendar. Calendar Ace! Awarded to those who’d collected five or more Wondermark Calendars over the previous ten years. 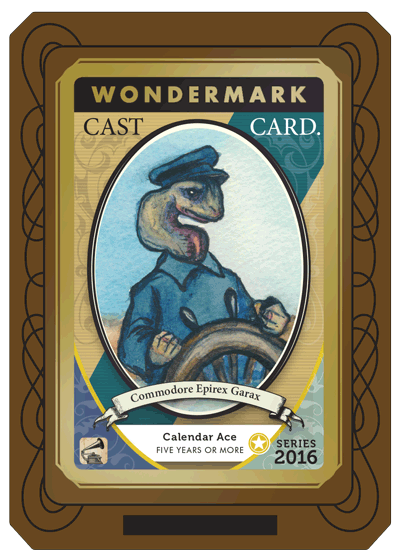 The Commodore is a character from the 2013 edition, The Gaxian Almanac. Patreon Exclusive (December 2016). Sent to participants in the monthly subscription program. 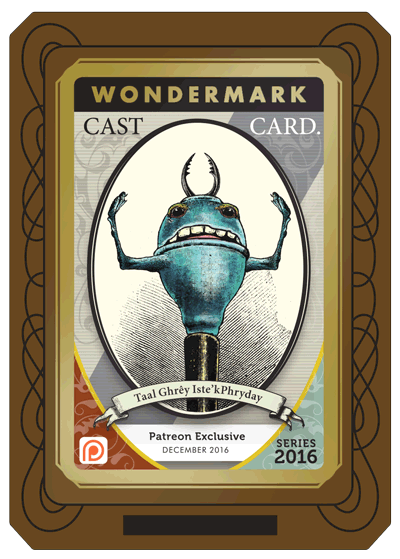 This creature from the mysterious Phryday is from Wondermark episode #1017. Patreon Exclusive (January 2017). Sent to participants in the monthly subscription program. 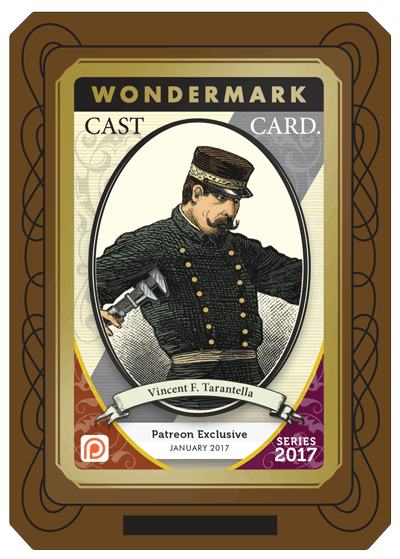 Vince is from Wondermark episode #523. 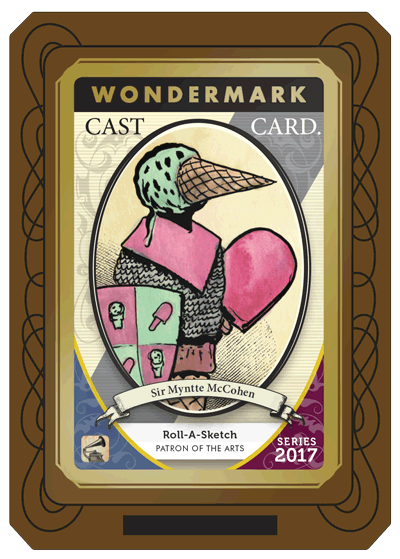 This card could be obtained by commissioning a Roll-a-Sketch drawing from me in 2017! This character in particular hails from the Roll-a-Sketch Yearbook, our calendar for 2014. 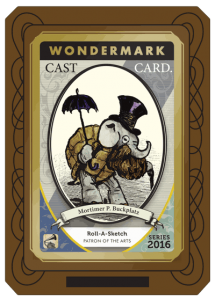 If you commissioned a Roll-a-Sketch in 2017 and didn’t get one of these, you can email me (with a picture of the sketch) and I’m happy to send you one retroactively. Patreon Exclusive (February 2017). Sent to participants in the monthly subscription program. 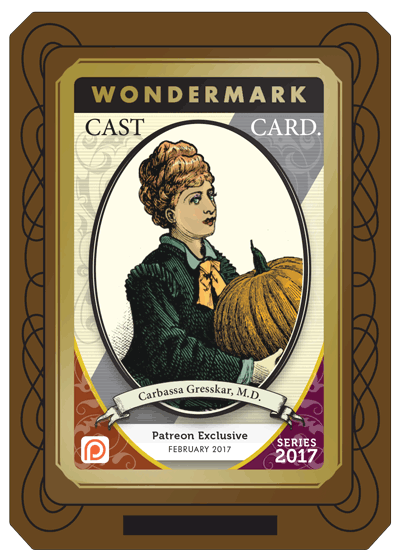 Carbassa is from Wondermark episode #978. Patreon Exclusive (March 2017). Sent to participants in the monthly subscription program. 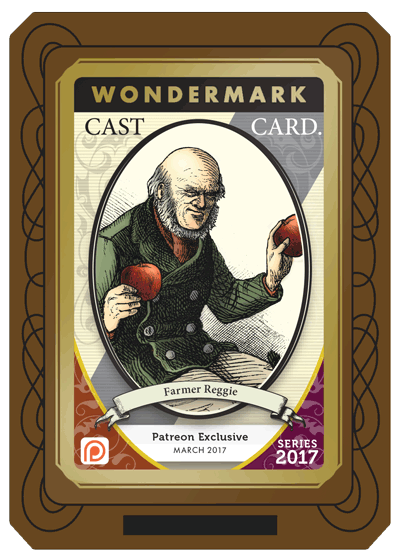 Farmer Reggie is from Wondermark episode #767. Patreon Exclusive (April 2017). Sent to participants in the monthly subscription program. 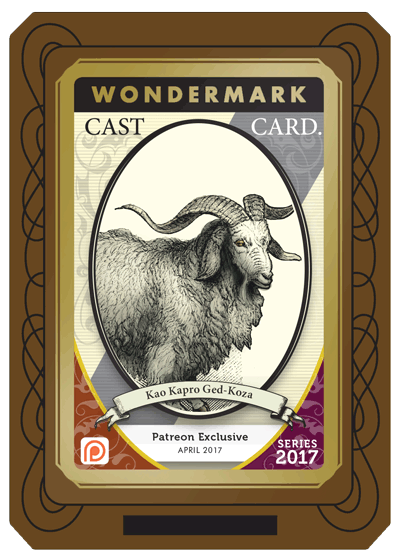 Ged-Koza is from Wondermark episode #563. Patreon Exclusive (May 2017). Sent to participants in the monthly subscription program. 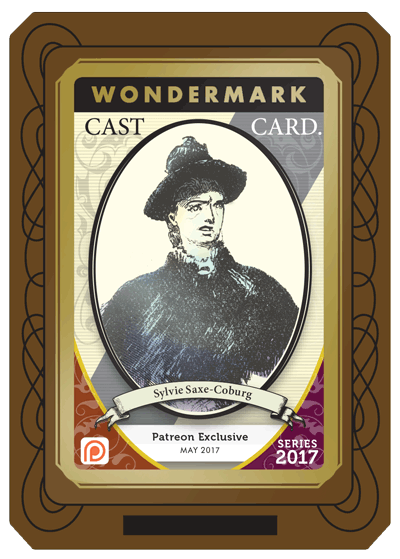 Sylvie is from the storyline that begins with Wondermark episode #670. Patreon Exclusive (June 2017). Sent to participants in the monthly subscription program. Friar Pollux is from Wondermark episode #984. Patreon Exclusive (July 2017). Sent to participants in the monthly subscription program. 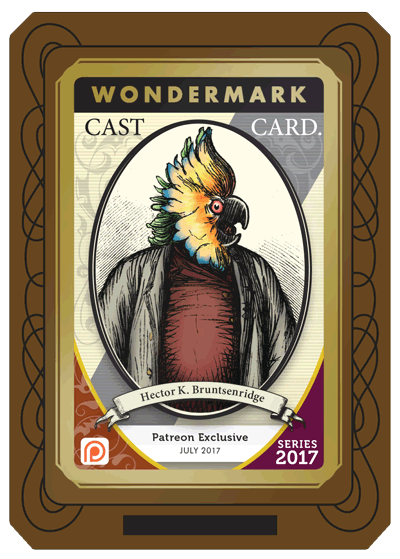 Hector is from Wondermark episode #584. Patreon Exclusive (August 2017). Sent to participants in the monthly subscription program. 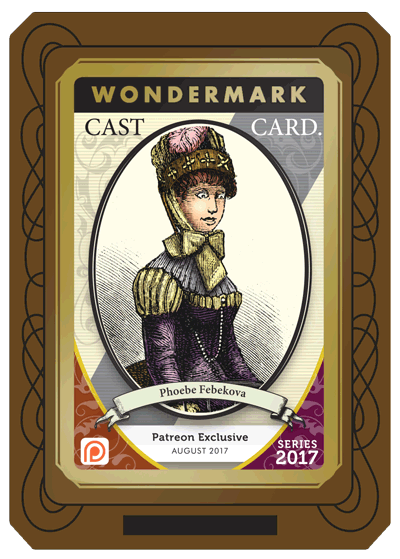 Phoebe is from Wondermark episode #592. Patreon Exclusive (September 2017). Sent to participants in the monthly subscription program. 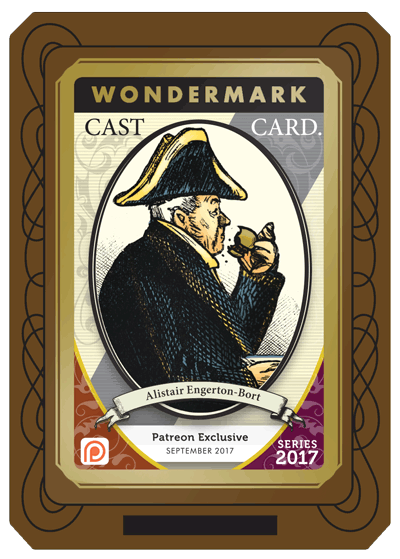 Alistair is from Wondermark episode #1064. Patreon Exclusive (October 2017). Sent to participants in the monthly subscription program. 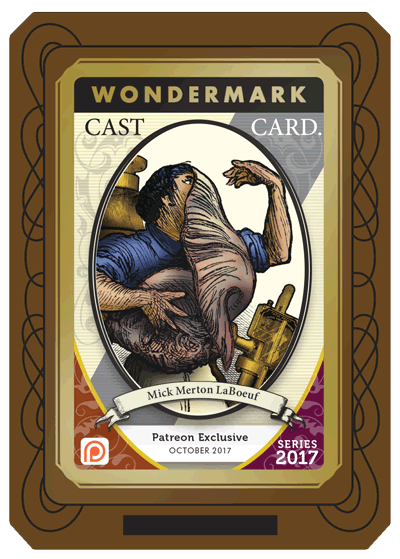 Mick Morton is from Wondermark episode #1061. Given to backers of the Wall Buddies Kickstarter campaign in fall 2017. 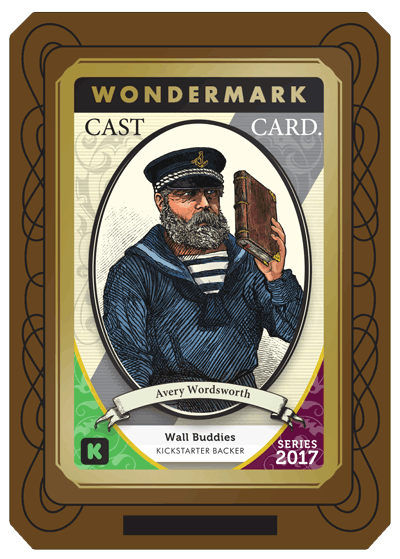 Avery is the author of “A Treatise on the Inventive Mind”, the inspiration for our line of Wall Buddies. Patreon Exclusive (November 2017). Sent to participants in the monthly subscription program. 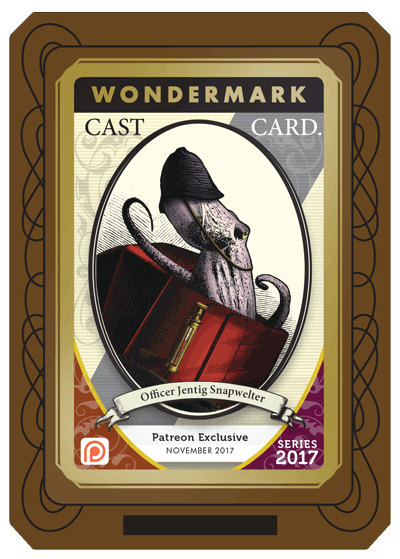 Officer Snapwelter is from Wondermark episode #574. Patreon Exclusive (December 2017). Sent to participants in the monthly subscription program. 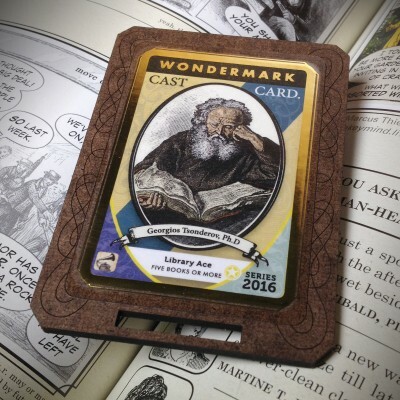 Chake is from Wondermark episode #1067, and was also featured (minorly) in the 2017 Wondermark Calendar. 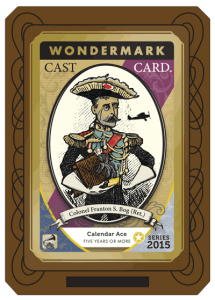 Offered with copies of the 2018 Wondermark Calendar. 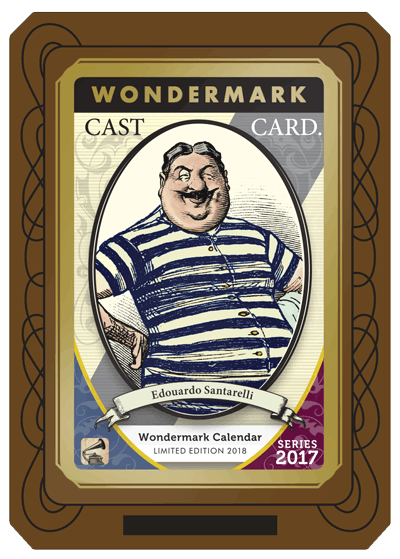 Edouardo is the proprietor of Santarelli & Sons Expert Thingsmiths, the sponsor of the calendar that year. Calendar Ace! 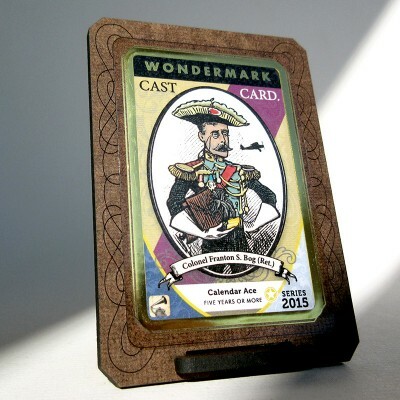 Awarded in December 2017 to those who have collected five or more Wondermark Calendars over the previous eleven years. Chensley is a character from the 2015 edition, The Concert of Conscience. Patreon Exclusive (January 2018). Sent to participants in the monthly subscription program. 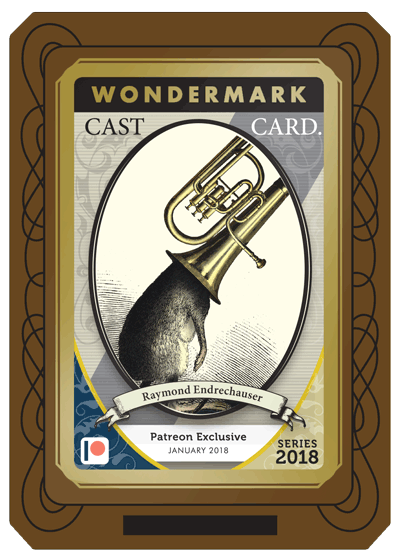 Raymond is from Wondermark episode #585. Will be awarded to the winner, and any honorable mentions, in the (upcoming) 2018 Wondermark Caption Contest. Patreon Exclusive (February 2018). Sent to participants in the monthly subscription program. 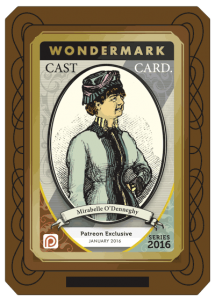 Ms. Wrentzling is from Wondermark episode #844. 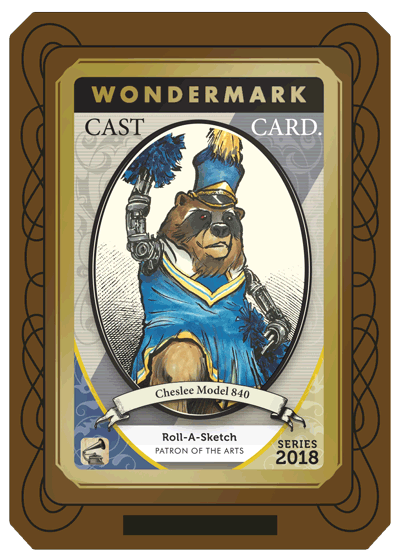 This card may be obtained by commissioning a Roll-a-Sketch drawing from me in 2018! This character in particular hails from a sketch I did at Gen Con in 2017. Patreon Exclusive (March 2018). Sent to participants in the monthly subscription program. 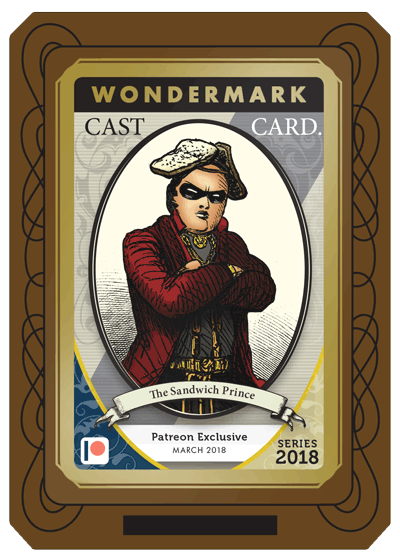 The Sandwich Prince is from Wondermark episode #640. If you got a Roll-a-Sketch drawing from me in 2016 or 2017, and I didn’t give you a card at that time because I am very absent-minded, feel free to email me (with a picture of the sketch) and I’ll send you one from that year! 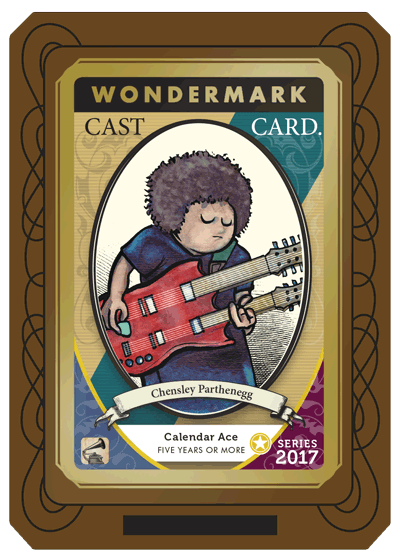 Cast Card #40, Cheslee, will be available at all my convention appearances in 2018. 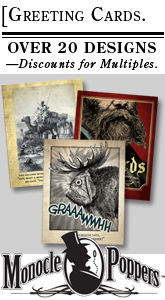 Our subscription program is ongoing; subscribers get a brand-new card produced and sent to them every single month! 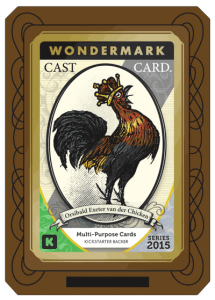 Other new card releases are announced on the Wondermark blog.